The Chevrolet Silverado 4500HD, 5500HD and 6500HD medium-duty chassis cab trucks are in production and on their way to dealerships. The trucks, which were first shown to the public at the 2018 NTEA Work Truck Show, are designed to be the most customer-focused medium-duty trucks of any major competitor. 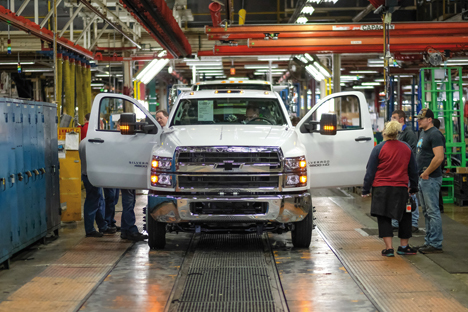 The Silverado medium-duty production launch caps a record year for GM’s Commercial business, with a double-digit year-over-year sales increase expected. The new Silverado trucks are popular with upfitters because the clean, straight frame rail design has no rivets, brackets or welds to get in the way. Additionally, the 7 cab-to-axle lengths can work for a variety of upfits. Some of the strongest interest has come from the housing and highway construction, landscaping and utility industries. The Silverado medium-duty chassis cab is just 1 of 3 all-new Silverado models Chevrolet is introducing within just 18 months, including the Silverado 1500, 2500HD and 3500HD.